What is the Meaning of TAKE OUT? 1. My husband is going to take me out to the theatre for our anniversary. 2. He took her out to dinner on Friday evening. Use this for nicer restaurants. It is not normally used for fast food restaurants. 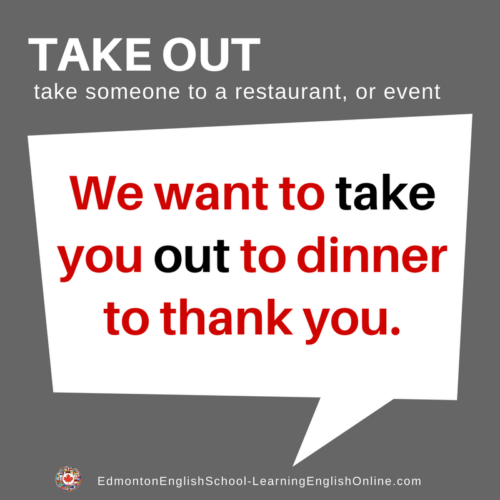 Don’t confuse this phrasal verb with the noun take-out. The meaning is very different. Take-out is food that you purchase from a restaurant (such as pizza), then take home to eat. In speech, the phrasal verb is stressed on OUT. The noun is stressed on TAKE.